where ft has been written for the total gravitational potential at the place under consideration. For constant V (Boyle's law), and for a single spherical body, the previous formula (3) reappears. 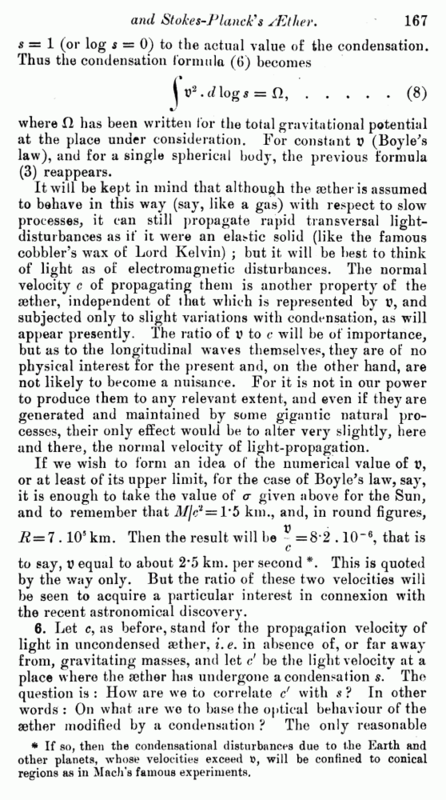 It will be kept in mind that although the aether is assumed to behave in this way (say, like a gas) with respect to slow processes, it can still propagate rapid transversal light— disturbances as if it were an elastic solid (like the famous cobbler’s wax of Lord Kelvin) ; but it will be best to think of light as of electromagnetic disturbances. The normal velocity c of propagating them is another property of the aether, independent of I hat which is represented by v, and subjected only to slight variations with condensation, as will appear presently. The ratio of V to c wTill be of importance, but as to the longitudinal waves themselves, they are of no physical interest for the present and, on the other hand, are not likely to become a nuisance. For it is not in our power to produce them to any relevant extent, and even if they are generated and maintained by some gigantic natural processes, their only effect would be to alter very slightly, here and there, the normal velocity of light-propagation. to say, V equal to about 2*5 km. per second *. This is quoted by the way only. But the ratio of these two velocities will be seen to acquire a particular interest in connexion with the recent astronomical discovery. * If so, then the condensational disturbances due to the Earth and other planets, whose velocities exceed will be confined to conical regions as in Mach’s famous experiments. answer is: On experience. For, clearly, we cannot deduce <i relation, which is essentially electro-mechanical, from mechanical principles alone, or from electromagnetism alone. Nor can we imitate the usual dispersion theory (which makes use of both kinds of principles), for we are interested in those portions of the aether in which there are no atoms and no electrons. 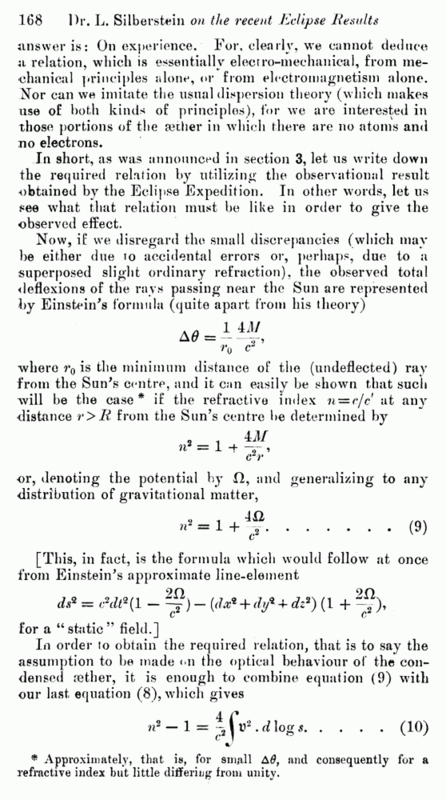 In short, as was announced in section 3, let us write down the required relation by utilizing the observational result obtained by the Eclipse Expedition. In other words, let us see what that relation must be like in order to give the observed effect. * Approximately, that is, for small A6, and consequently for a refractive index but little differing from unity.